In accordance with recent federal regulations, you may request that Easton Utilities install an Excess Flow Valve (EFV) on your existing gas service line. An EFV is a mechanical safety device installed inside a gas service line between the gas main and the gas meter. Although an EFV is not required for the normal, safe operation of your gas service line, an EFV could help mitigate the consequences of a service line break by restricting or stopping the gas flow. Customer Eligibility: Many customers already have an EFV installed on thei r existing service line; those who do not may be eligible to have one installed. Most residential and small commercial customers will be eligible. If you are interested and to determine if you are eligible to have an EFV installed, please contact Easton Utilities at 410-822-6110. 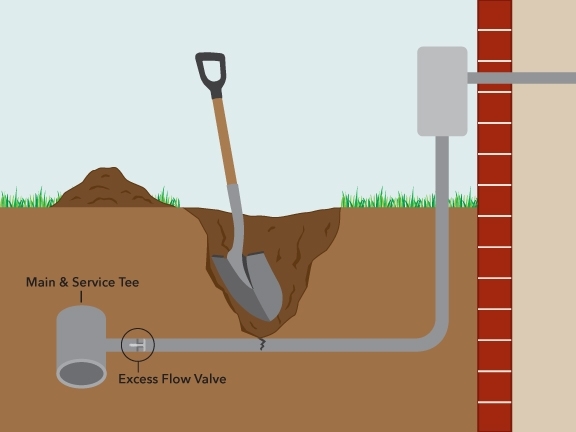 Safety Benefits: An EFV is designed to shut off the flow of natural gas if a service line is inadvertently dug into by a home owner or contractor during excavation. Restricting the gas flow after a gas service line is damaged may decrease the potential for property damage and/or injury. What an EFV cannot do: Installation of an EFV will not protect against leaks on customer appliances or house piping. EFVs also do not protect against leaks on the gas meter or slow leaks on the service line. Cost and Installation: The cost of installing the EFV will be at the expense of the customer. The average installation cost is typically $1,000, but the actual cost will depend on the difficulty of installation. We will inform you of the actual cost before you make the final decision to install an EFV. The installation of an EFV will be scheduled at a mutually agreeable date pending the approval of any required permits and weather conditions. • For your safety, always call 811 to have gas line and other buried utilities marked before allowing anyone to dig in your yard. • Call Easton Utilities if upgrading or adding gas equipment that may significantly increase your gas usage to avoid false tripping the EFV.